I love Syrahs. They stand on their own two feet. No need for blending with other grapes. I enjoy their ruby colour in the glass; their aromas, especially blueberries; their full body, red/black berry flavours and sometimes white pepper that plays on your palate. BC can make some very good Syrahs. Located in the South Okanagan, one of the wineries which I think fit in that category is Le Vieux Pin. They take their inspiration from the French wine tradition, the Rhone Valley in particular, producing Syrahs and some aromatic whites using Marsanne, Roussanne and Viognier grapes. I was privileged to receive the latest Syrah and aromatic white releases from Le Vieux Pin to taste and tell you about. I received two Syrahs from the 2011 vintage. 2011 was overall cool growing season that did warm up towards harvest. The grapes did achieve full phenolic ripeness but had low sugar levels. I have tried some other 2011 wines from other BC wineries and even though it was a cool season, the wines were very balanced and had good fruit flavour. I also received two bottles of white wines from the 2012 vintage. Both wines are blends of various aromatic white varieties. 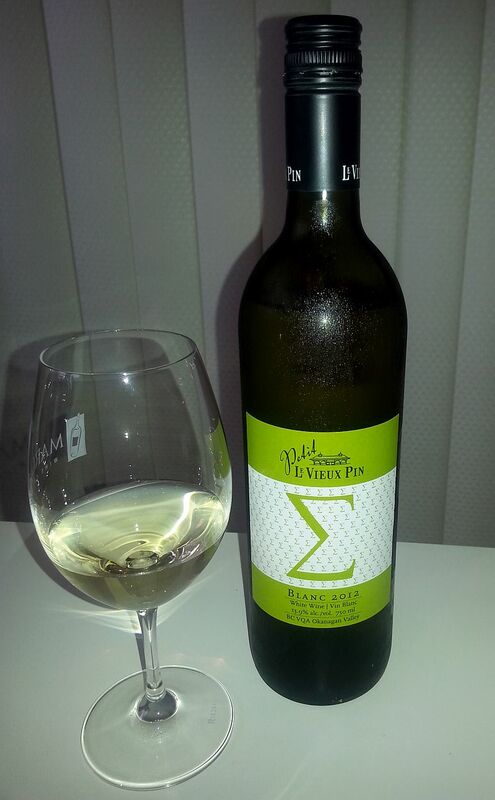 Le Vieux Pin Petit Sigma Blanc 2012 – ($17) – Why Petit? Petit wines from France are the second labels of famous wineries. In some vintages a winery may determine that some grapes did not reach the quality needed for their top tier wine, so the grapes go into their second tier wine. An example of this second tier is Pavillon Rouge du Chateau Margaux. This Petit wine is a blend of Sauvignon Blanc, Pinot Gris, Chardonnay, Viognier, Muscat, Gewurztraminer, Roussanne, Marsanne, and Erhenfelser. The wine had waxy, lemony, and grapefruit aromas with a hint of flowers. It was dry with medium plus acidity and some viscosity in the mouth. I picked up some light tropical fruit that was underlain with full citrus flavours, particularly lemon, but also a hint of lime. There was also some pear and apple in the background. Steely on the palate. Peppery and mouth watering on the finish with some grapefruit rind flavour. A good wine for your summer, in a screw cap, so meant to be enjoyed now. 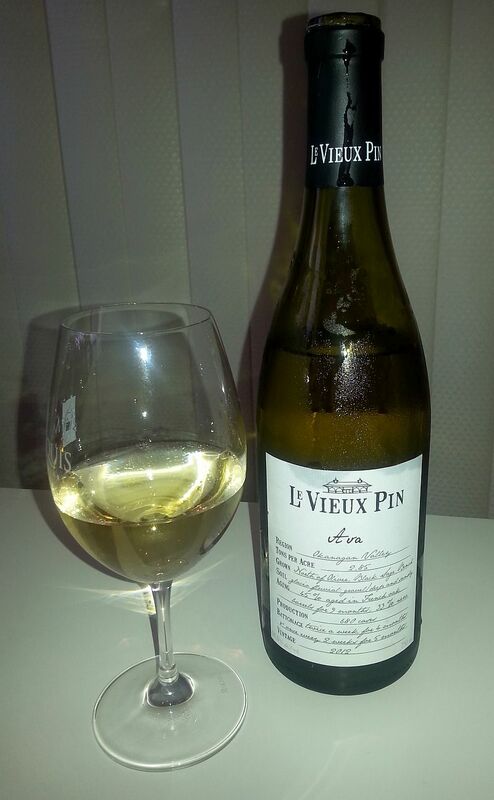 Le Vieux PIn Ava 2012 ($35) – Is a blend composed of 61% Viognier, 21% Roussanne and 18% Marsanne. This is a very interesting wine that changed a lot while I sipped and savoured it over about a half hour. It started out with light baby powder, sweet spice, peach and apricot aromas. Medium plus body with round mouth feel and weight. Fairly intense fruit flavours, which showed up in layers on my palate, starting with apricot, and progressing through tropical fruit, citrus, red delicious apple, and peaches on the finish. All the flavours were light and balanced. There was also some vanilla but supported rather than overpowered the wine. I also picked up a bit of pepper on the tongue. Medium plus length. With half an hour of the wine breathing in my glass, I started to pick up on herbaceousness, honey, flowers, and oranges on the palate. So savour this wine and enjoy all that it offers. This is an excellent white wine that you can drink now or hold for a year. 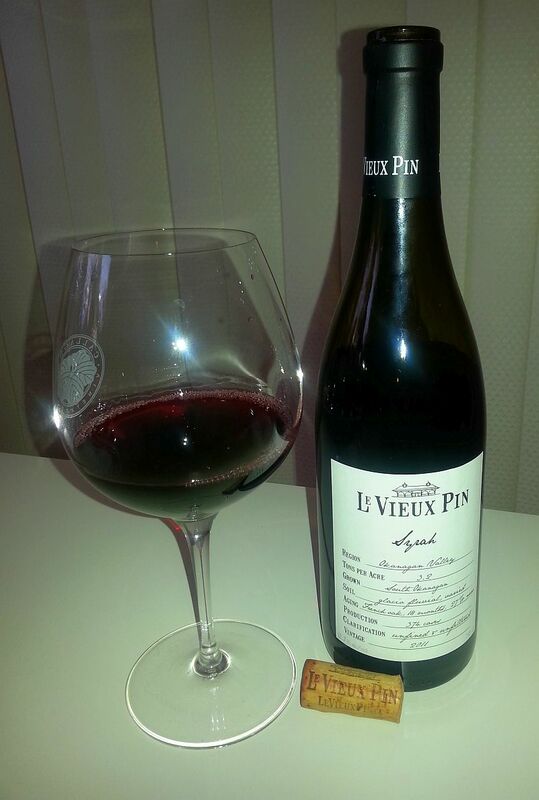 Le Vieux Pin Syrah 2011 ($45) – This wine was deep ruby, almost opaque from the core to the rim. Pretty nose with baby powder, ripe purple fruit, black berries, black currants, and black cherries, and some sweet spice in the background. With some time in the glass, I also picked up red cherries and perfume. Dry on the palate, medium body with softer tannins. The first thing I picked up before the fruit flavours was the minerality in this wine, which I quite liked. All the fruit flavours of raspberries, red/black cherries, plums, strawberries and blackberries were balanced and none overpowered the others. As on the nose, with some times in the glass, some violet and rose perfume showed up on the palate. The wine finished with minerality and mouth watering acidity. A very good wine, which again can be enjoyed now, or put away for 1-2 years. A very balanced wine. 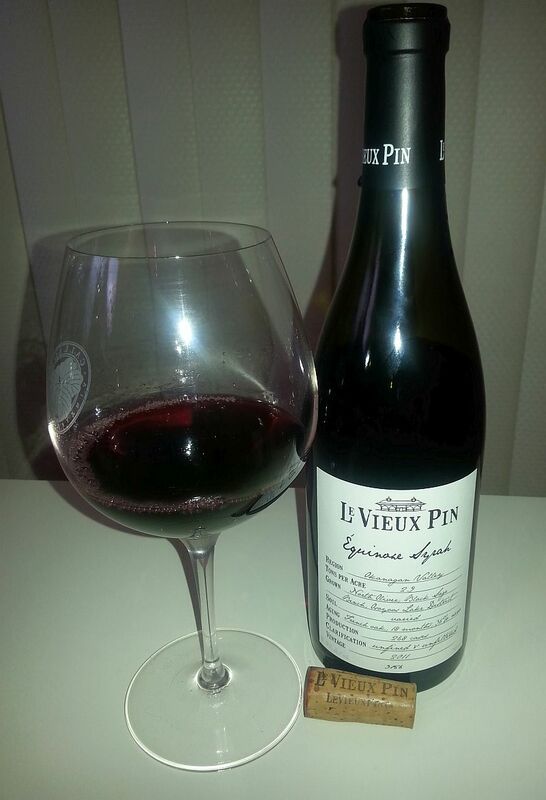 Le Vieux Pin Equinoxe Syrah 2011 (~$80) – Equinoxe Syrah is the top wine for Le Vieux Pin with a limited production of 268 cases. As is sometimes done in the Rhone Valley, this Syrah was co-fermented with 1% Viognier, which helps produce a deeper colour to the wine as well as offer a floral component in some cases. This was was aged in French oak barriques for 18 months, with 36% being new barrels. This was also also deep ruby in colour, almost opaque from core to the rim. The baby powder aroma in this wine was more intense than in the regular Syrah. It was followed by raspberry, plum and blueberry aromas. Later on there was black cherries and black currants, followed by smokiness and dark chocolate. On my second day of tasting, the smokiness was more prominent and the baby powder aroma was subdued. Dry with medium tannins and acidity, but medium plus body and flavour intensity. Dry with some roundness on the tongue. The fruit flavour intensity builds to the finish. The fruit flavours again came in one after the other starting with raspberries, then black cherries and blueberries. In addition I picked up some oak, red currant and sweet spice. Up front with the fruit was nice saline minerality. On Day 2 of my tasting, smokiness showed up together with the raspberries on the palate. Medium plus finish with plums, berries, sweet spice and oak flavours, and tannins running down the centre of your tongue. An outstanding wine that I would leave to age for 1-4 years. Day 3 update – Violets on the palate are quite prominent. It is so interesting to taste a wine as it changes over time! Tasted Equinoxe Syrah and have a few bottles at home. One of my Favs.